Australian GDP printed at a solid 3.5% Y/Y rate and retail sales expanded .2% M/M. There was also the AIG services number which was reported at 49.9, just shy of expansion. Note the inclusion of the negative effects of a severe winter weather on the Canadian economy. 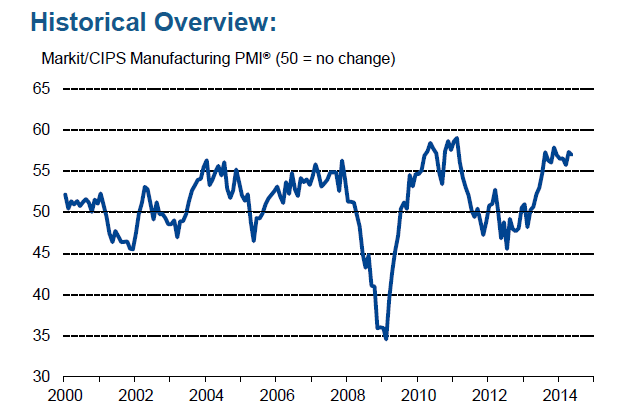 RBC also issued its monthly manufacturing PMI which registered a 52.2. While exports and imports declined slightly, the overall trend for both is encouraging. While an increase in imports might seem a bit counter-intuitive as a good sign, it usually means the domestic demand is increasing. Finally, the Canadian unemployment rate increased .1% to 7%, but this increase was due to more people entering the labor market. The biggest news out of the US was the 217,000 payroll increase and unemployment rate of 6.3%. This was a treading water report. While jobs grew, there were no meaningful revisions to previous reports and hourly wages barely grew. But on the plus side were the new auto sales numbers of 8.04 million units at an annual pace, a 58.1 service PMI and 55.4 manufacturing number. Overall, the possibility of continued positive economic numbers from the US is continuing. Japanese news was very light last week. The PMI manufacturing number was 49.9 while the services index was 49.3. The negative number for both was attributed to the recent increase in the sales tax. By far, the best news this week was the ECB’s actions to lower rates. While a good argument could be made that they should have acted sooner, at least they have finally acted. And, with their move into negative interest rates, further, aggressive action might be forthcoming. The UK continues to print the best numbers of OECD countries, while the US and Canada are still slogging through slower than anticipated growth. Hey Hale, I am rather new to your work, and have only been following you for the past couple of months, and so far, I like your style a lot. You present a lot of good economic indicators, some that I never knew existed. Here is one of them. I have been concerned for a while, that the low Initial Jobless Claims, might be giving us a false signal, about the true strength of our labor market. After all, if new workers are not offered any benefits, and they are let go, they probably will not file for something that they are not entitled to get. But on your Friday Non Farm Payroll report, you mentioned the 5 Week Unemployment Index, and so I back tested it, and found that in 10 of our last 11 recessons, when you got a 25% increase in this index, you got a recession, and it was on average one month late in giving the signal. The only recession that this did not work, was the 1990-91 recession, where we never even got close to hitting 25%. Right now, this index is only 5% above its recovery low, so this indicator is confriming that recession should not be a concern for us, even with our first quarter negative GDP. Thanks again for all your fine work. And keep sharing great economic indicators wtih us.